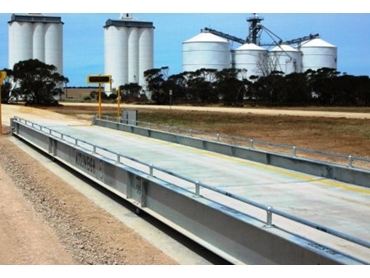 A Truck Scale Weighbridge required custom foundations as an installation pre-requisite at Viterra’s Apamurra site in South Australia. Supplied by Accuweigh’s Port Adelaide branch, a custom Thickened Raft Footing System Truck Scale Foundation was designed specifically to suit this site’s HD soil class. This Truck Scale measures twenty-eight metres long by three and a half metres wide for ease of access by longer vehicles and was certified for Trade Use with a weighing capacity of eighty tonnes using dual weighing ranges. For heavy duty weighing applications with high traffic throughput, Truck Scales fitted with concrete weighing decks are much preferred over steel deck weighbridges due to the inherent strength of the added mass of concrete that eliminates excessive flexing of the deck under heavy vehicle loads. All steelwork of Accuweigh’s Truck Scales is fully hot dip galvanised for strong corrosion resistance against weathering. Due to extra thickness of the foundations, longer than usual access ramps measuring five metres long were installed to minimise stresses imposed on vehicles entering and departing the Truck Scales. “No Step” barriers were fitted to the top of the main beams to remind drivers of the OH&S requirements to not exit their vehicles using the potentially slippery metal beams as a step. A host of control equipment was then fitted to the Truck Scales to allow “Unattended Operation” which allows drivers to perform vehicle weighings without the assistance of an operator. Speed bumps are fitted to the approaches to minimise vehicle speeds when entering or leaving the weighing deck to eliminate excessively heavy vehicle breaking which could cause potential load cell damage in extreme circumstances..
Accuweigh is Australia’s largest industrial weighing company and has extensive industry experience in all scales and weighing applications. Fully trained and highly experienced service crews are located in eight branches across mainland states providing Superior Product Support on all Truck Scales & Weighbridges.